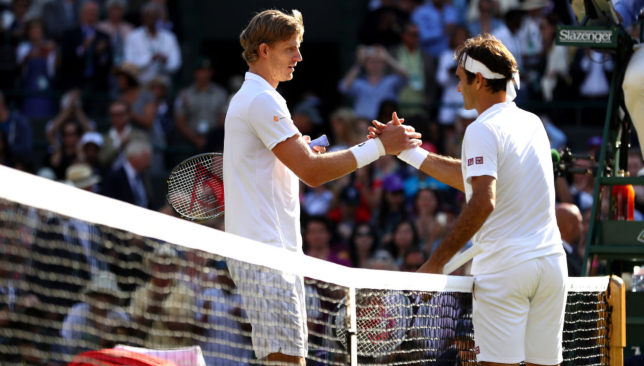 Roger Federer crashed out of Wimbledon after a marathon five-set shoot-out with big-serving Kevin Anderson in the quarter-finals. The eight-time champion was two sets up and had a match point in the third, but almost three hours later he trudged off on the end of a seismic 2-6 6-7 (5/7) 7-5 6-4 13-11 upset. Federer found himself scheduled on Court One having been ousted from his usual Centre Court domain for the first time in three years. But he found himself in even more unfamiliar territory with an inspired Anderson’s relentless, thudding serve eventually overpowering the 20-time grand slam winner. The setting was not the only thing alien to the defending champion. When Anderson broke in the second set it was the first time the Swiss had dropped serve at this Wimbledon. In their four previous meetings Anderson, 32, had not taken a set off Federer. Nor had anyone over the last 34 sets Federer had played at the All England Club, until Anderson nicked the third. That meant Federer had equalled but not bettered his previous best set-winning streak which came between the third round in 2005 and the final in 2006. But that turned out to be the least of his worries. There was little sign of the drama which unfolded when Federer raced through the first set in 26 minutes. Yet Anderson, the eighth seed, was meant to pose a far greater threat to Federer than his previous four opponents, and so it proved. The first hiccup surfaced at the start of the second set with Anderson breaking the Federer serve and ending that run of holds. Normal service was resumed for a while at least as Federer held to love before immediately breaking back and taking the ensuing tie-break. Anderson was sticking to his guns, though, and after saving match point the eighth seed secured another break of the Federer serve and snatched a set back. When Anderson broke again in the fourth, Federer was suddenly on the ropes. The Swiss lost the set in a flurry of aces, with Anderson’s relentless, powerful serve sending the match into a decider. The final set lasted 90 minutes, and it was captivating stuff. Federer eked out a break point at 4-3, Anderson quickly snuffed it out, then Anderson served to stay in the match, and did so to love. On they went, both holding to love for 10-10, but at 11-11 it was Federer who blinked first, a double fault handing Anderson a rare break point which he converted. Anderson needed four more booming serves to reach a first Wimbledon semi-final, and he found them. “I’m not quite sure what to say, I had to try my best to keep fighting,” Anderson told the BBC. “I scraped through the third and fourth sets and by the end I thought I did a great job. Beating Roger Federer will be one to remember, certainly in such a close match. 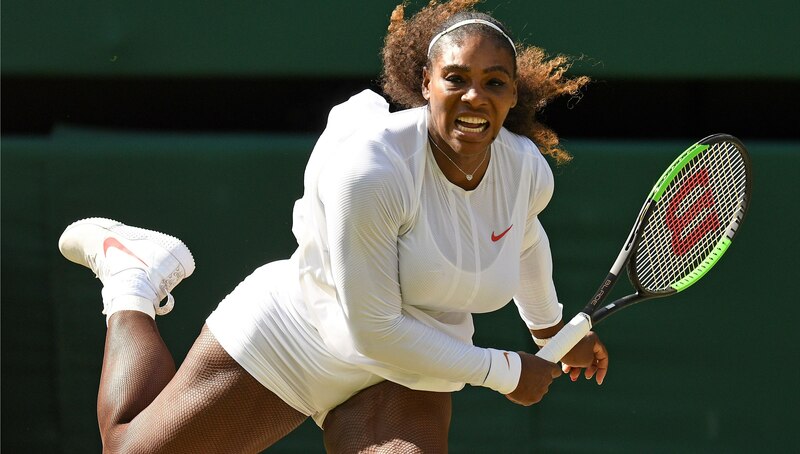 Serena Williams survived the first major scare of her Wimbledon comeback to book a semi-final place. The seven-time champion, who missed the tournament last year, was outplayed by Italian Camila Giorgi initially but fought back impressively to win 3-6 6-3 6-4 on Centre Court. Having swept all before her in the last two years she played Wimbledon, in 2015 and 2016, American Williams has now extended her winning streak at the All England Club to 19 matches. 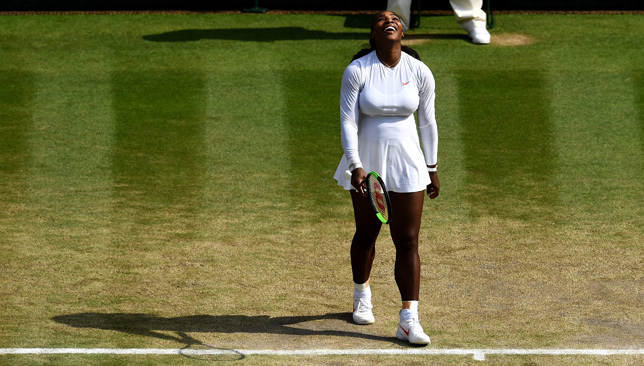 This is just her fourth tournament back since giving birth last September, and Williams is one win away from a 10th Wimbledon singles final appearance. Williams will next face Germany’s Julia Goerges, the 13th seed, who reached her first grand slam semi-final with victory over Kiki Bertens. The 29-year-old dropped the first set to Dutch 20th seed Bertens but fought back to win 3-6 7-5 6-1. Angelique Kerber admitted nerves almost got the better of her after needing seven match points to see off Russian youngster Daria Kasatkina. Kerber came out on top of a spectacular 25-shot rally to force the all-important match point number seven, and finally got the job done as Kasatkina netted a forehand, the German relieved to be a 6-3 7-5 winner. “We both played at a really high level, starting from the first point,” Kerber said. Kasatkina had Kerber scurrying and scrambling during some compelling rallies but ultimately a vulnerable serve, which offered up seven double faults, let her down. The 30-year-old slipped out of the world’s top 20 after a miserable 2017, but she has rediscovered her game this year. That next match will be against another 21-year-old in 12th seed Jelena Ostapenko, who won last year’s French Open. Ostapenko roared into her first Wimbledon semi-final with a display of power-hitting against Dominika Cibulkova.